Are you Unwittingly Sabotaging Your Sleep? You’ve likely heard of your circadian rhythm. This is your internal biological clock that regulates your internal biological processes. This internal biological clock should be in synch with the 24 hour light- dark cycle. Disturbances in your circadian rhythm, where your biological processes become desynchronized with the 24 hour light and dark cycle can have profound effects on your ability to sleep and your overall health. Patterns of brain wave activity, hormone recycling and production, detoxification, cell regeneration, and other biological activities are linked to this 24-hour cycle. Two major players in your circadian rhythm and your sleep-wake cycle are cortisol and melatonin. Your body has a 24 hour cycle with both of these hormones, as they serve as biological signals to wake you up and help you sleep. They have an inverse relationship; when one is high, the other is low. Following your circadian rhythm, the cycle of these two hormones, helps to determine your sleep patterns – when you sleep, when you wake, and your quality of sleep. The time frame where adults can get the deepest sleep generally occurs between 2:00-4:00 am, when cortisol is lowest and melatonin is highest. If cortisol is not low enough, or if melatonin is not high enough, your sleep will be restless and you may wake frequently. "Are You Unwittingly Sabotaging Your Sleep? 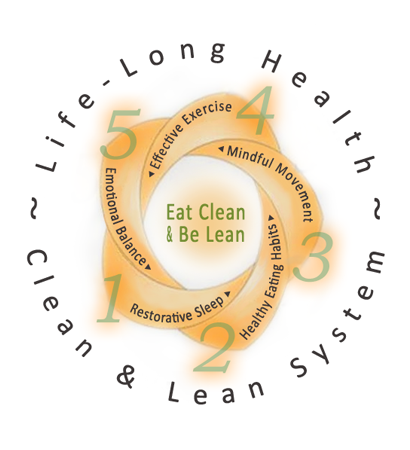 Reading a great post www.CleanAndLeanSystem.com"
So, what causes interruptions to the cycle of these two hormones? Stress is a big culprit, but it isn’t the only culprit. Stress triggers chronic production of cortisol across the day and it can even lead to a change in cortisol cycling; with lower cortisol production in the morning and higher cortisol production in the evening. And stress interferes with melatonin production in the evening. As much as you likely equate cortisol with stress – you’ve heard that chronically high cortisol levels increase inflammation and belly fat, for example, cortisol is what wakes you up in the morning. It is called the Cortisol Awakening Response, or CAR. This rise in cortisol begins before you wake up. Cortisol is released from the adrenal glands, which are signaled through the HPA axis. This is the hypothalamus-pituitary- adrenal axis. It is thought that this early morning rise in cortisol is to help the body quickly adapt and relate to its environment, when it wakes up. This is a survival mechanism. Cortisol levels are lowest at 2AM. They begin to rise between 3-4AM, peak around 7-8AM and then your cortisol levels gently fall off across the rest of the day. Melatonin levels, on the other hand, are lowest in the morning. They start to rise in response to darkness, around 7-9PM. Melatonin suppresses the activity of other excitatory neurotransmitters and helps to calm the brain (in part by countering the stress hormone cortisol from our adrenal gland). As this happens, you become drowsy. So, what’s the other culprit? Did you guess? Artificial exposure to light and dark is the other desynchronizing trigger. Melatonin is secreted largely in response to darkness. And your evening cortisol levels are lowest in environments with low noise. So, if you are watching TV, playing video games, or answering email late into the evening you are unwittingly sabotaging your natural ability to fall asleep. You are getting in the way of these natural pro-sleep chemical shifts. These devices confuse the brain about whether it’s night-time or not. If you are watching TV into the evening, think about what the loud commercials are doing to your cortisol and melatonin levels. Don’t read from a backlit device at night (such as tablet). Researchers found that two hours of exposure to a backlit tablet e-reader, suppressed melatonin by up to 22%. Instead read a paperback book. Use regular old incandescent light bulbs in your bedroom. Yes, I realize these aren’t as ‘green’ and eco-friendly, but they aren’t blue either. The short wave blue light that is emitted from compact florescent light bulbs and LED light bulbs stimulates alertness in the brain. Blue light is the most stimulating light to your brain. If you are trying to wind down for bed and read, and yet you are visually being triggered by blue light emitting lights, you are going to have a hard time shifting into lower brain wave activity to fall asleep and stay asleep. This is also true for watching television into the evening. The large screen LED and LCD televisions emit a large amount of the short wave light, blue light. Though this blue light seems pleasant enough on the eyes when you are watching TV, again, this is the most stimulating to the brain, of all the light wave lengths. Turn off the television for at least two hours prior to bed. Consider using low-wattage bulbs in your bedroom lamps so you can easily turn the overhead lights off and create a dim lit environment. When it’s time to sleep, make sure the room is dark. The darker it is, the better you will sleep. Cover electrical displays, and use heavy curtains or shades to block light from windows.